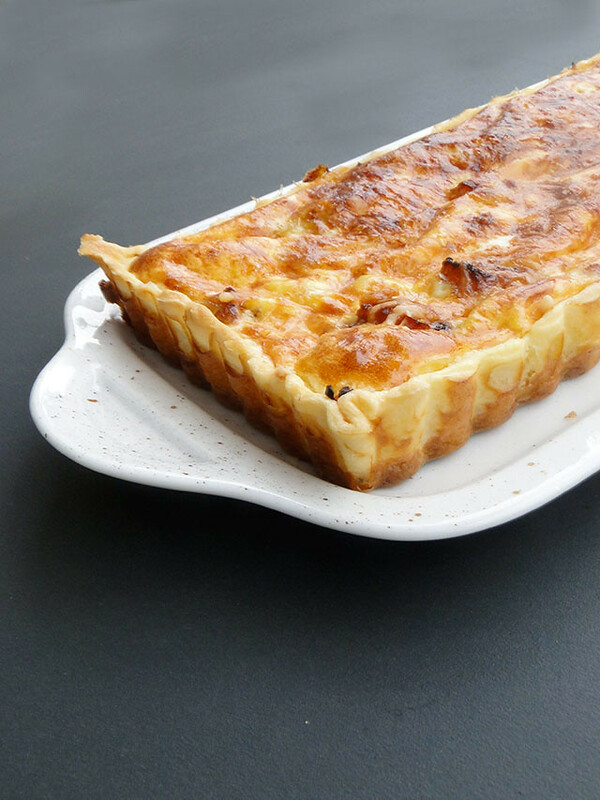 Une tarte à l’oignon, or onion tart, quickly became my favorite dish when I first came to France. 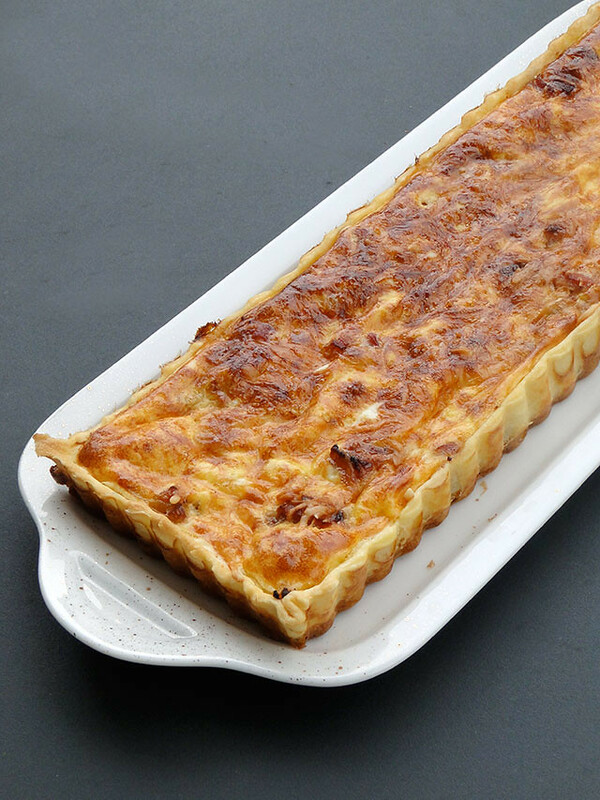 During the winter months making this tart and eating it hot from the oven with a green salad made for a most satisfying evening meal. I used to eat it a lot when I first came to France, a kind of grab-and-go food when I was strolling the cobblestone streets of Paris, especially during those wintry days, when the air was chilling, and I was searching for lunch and a chocolat chaud, passing by those food stands and finally picking up a steamy onion tart. 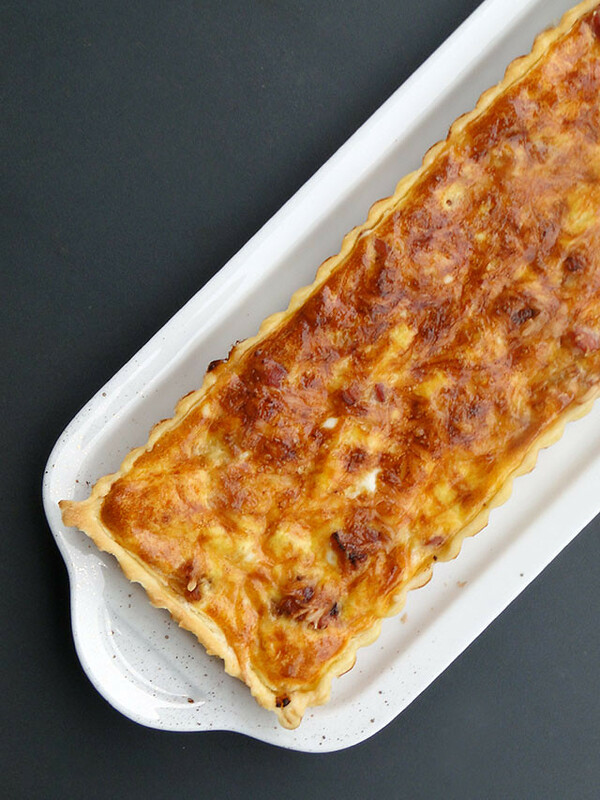 This tart is very easy to make and it's perfect with a glass of white wine and a light green salad!!! Sauté bacon in a medium saucepan over medium-high heat until bacon is cooked through and crisped, about 7 minutes. Set aside. In the same skillet, add the onions, and let them cook for 10 mn until cooked but not colored. Bake in the oven 25 to 30 mn or until golden. Faire chauffer une poêle et faites-y revenir les lardons. Ajouter les oignons et laisser les cuire à feu doux environ 10 mn. Ne pas les laisser colorer. Dans un saladier, fouetter les oeufs avec le lait. Saler et poivrer. (Attention ne pas trop saler puisque les lardons sont déjà salés). Etaler la pâte dans un moule à tarte, chemisé de papier sulfurisé, puis piquer le fond avec une fourchette. Répartir les oignons et les lardons sur le fond de tarte puis parsemer avec le fromage. Verser ensuite la préparation oeuf-lait. Enfourner 25 à 30 mn ou jusqu'à ce que le dessus soit doré. Onion tarts are fabulous! Yours looks absolutely scrummy. Mmm...when we vacationed in France I had a tart or quiche every morning for breakfast, and this brings back all those wonderful smells and flavors!! 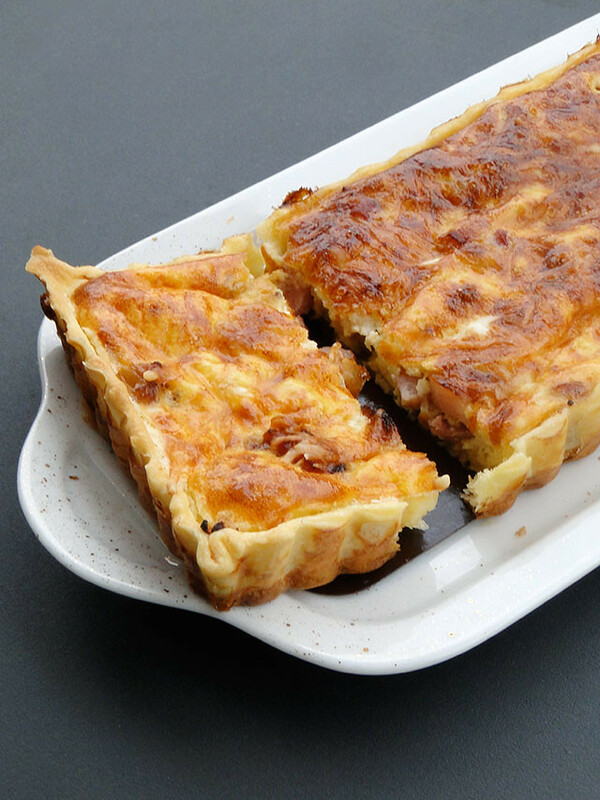 Yum, this sounds so delicious, I'm a huge fan of savoury tarts! Perfect and marvelous looking pie. I'd never get bored of eating pie like this. Ah yes...Gruyere is a fine choice for lovely tart. The flavour combination in this dish sounds delightful! It looks perfect!! You gave it a "parisienne" look !! Yum! I can't wait to try get out my rectangular pan and try this for a simple and delicious meal! I have this exact pan in my cupboard but I haven't unwrapped it yet! This looks so good and is something I know I'll love! thanks for sharing! This looks really good. Cant wait to try it! Ohhh! This looks fantastic! I can't wait to try it out!!!! Your onion tart looks fascinating! Great photos too. This is tart perfection. Absolutely. I love a good onion tart. You had me at the first picture. And, by the way, I must now go out and buy a lovely rectangular tart pan. Pretty! Amazing pictures!! Your food looks incredible. Cette tarte est un vrai délice!! I haven't gotten the opportunity to taste this dish, but I must say it looks delightful. I think is a kind of lasagna, but with a france modification, that honestly, I'm dying to taste. That is a good looking tart, thanks for sharing this one, the onion add such a great taste.